Business corporations can and do violate human rights all over the world, and they are often not held to account. Emblematic cases and situations such as the state of the Niger Delta and the collapse of the Rana Plaza factory are examples of corporate human rights abuses which are not adequately prevented and remedied. Business and human rights as a field seeks to enhance the accountability of business – companies and businesspeople – in the human rights area, or, to phrase it differently, to bridge the accountability gap. Bridging the accountability gap is to be understood as both setting standards and holding corporations and businesspeople to account if violations occur. 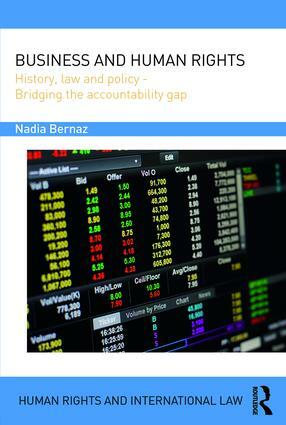 Adopting a legal perspective, this book presents the ways in which this dual undertaking has been and could be further carried out in the future, and evaluates the extent to which the various initiatives in the field bridge the corporate accountability gap. It looks at the historical background of the field of business and human rights, and examines salient periods, events and cases. The book then goes on to explore the relevance of international human rights law and international criminal law for global business. International soft law and policy initiatives which have blossomed in recent years are evaluated along with private modes of regulation. The book also examines how domestic law, especially the domestic law of multinational companies’ home countries, can be used to prevent and redress corporate related human rights violations.